DAC Ph.D. student Yuliang Zou shares research on unsupervised learning of depth prediction and optical flow estimation at ECCV. 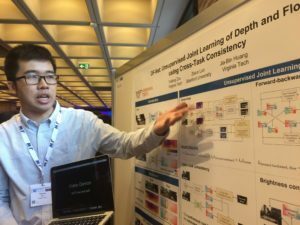 Yuliang Zou, a Ph.D. student at the Discovery Analytics Center, was in Munich, Germany, earlier this week to participate in the 2018 European Conference on Computer Vision ECCV. The conference, held every other year, is one of the most influential academic conferences for this area of research. This research, conducted with his DAC faculty advisor Jia-Bin Huang and Zelun Luo, a Stanford University student, focuses on unsupervised learning of depth prediction and optical flow estimation — two fundamental problems in computer vision with many applications. Zou also presented “iCAN: Instance-Centric Attention Network for Human-Object Interaction Detection,” at the 1st Person in Context (PIC) Workshop. The submission secured a third place on the person in context challenge and received a prize with two NVIDIA GPUs.